We’re in the midst of “Snowmaggedon” here in the Puget Sound, but the markets haven’t ground to a halt like this region has. Nor have corporations, trade negotiators, lawmakers, or the government (yet…check back this weekend for an update!). We hope you all are doing well in the midst of the storm, especially those with kids who have been home from school for much longer than you had hoped! If you want to give them a brief economics class, here’s a piece for you. As we have endured once-in-a-decade snowfall, the markets have “plowed” forward (forgive the pun…it was too tempting). 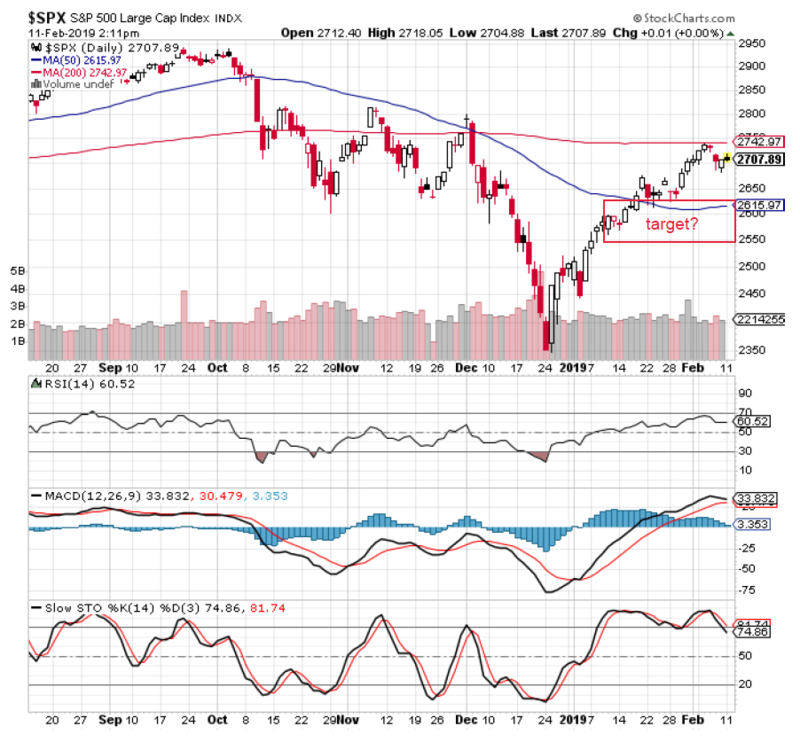 The market moved up over the past few sessions to a couple of key areas that historically proved to be prominent resistance points. The first one is the long-term 200-day moving average. Above the 200-day is considered to be in a bull market, while below the 200-day is generally considered to be in a bear market. We have been below the 200-day since the first part of December, including the horrific days leading up to Christmas Eve. The other resistance is the 61.8% Fibonacci retracement. Say what? For those of you who are unfamiliar with Leonardo Fibonacci, he was a mathematician in the 12th century and discovered that many things in the world are proportioned based on what he called the “golden rule.” Numbers like .382, .50, and .681 are found all over nature, from the ratio of length vs. width of flower pedals to number theory and seed layout in a sunflower seed. If you do the math, it’s amazing how often you can find the Fibonacci ratios in life. So too in the stock market. They tend to show up all the time and have been used for centuries to try and figure out where the market is going. Of course, no system is ever perfect. If it always worked then we would have all solved the code for the market. However, we do find it important enough to be aware of, since many others give those numbers a level of importance. As we have said so many times before, we don’t know (nor do we think anyone can know) where tops and bottoms are in the market. We would say anyone giving a specific number or date is strictly guessing. But we can say that there is a weight of the evidence, whether it is price-to-earnings in the market, overbought/oversold levels, or Fibonacci numbers – not to mention fundamentals of company earnings and growth rates. These and many more indicators give us what we call the “weight of the evidence” to say how much risk is in the market and what the next move is likely to be. Since we are not day traders, we don’t try to figure out where the market is going in the next days or weeks, but to find out what the months or years trend will likely look like. As they say, the answer we give depends on the question you ask. So now let’s ask a couple questions. What does the near term (couple months) look like? With the 180 degree change from the FED, we are no longer expecting a full “retest” of the December lows, but would look for a retest somewhere between 2550 – 2620 on the S&P 500, to be followed by a rally that could take us up to test the previous highs or make new highs. What is the view over the next 1-3 years? That is a less clear, as there are many things that could affect the outcome. We are certainly at the tail end of the cycle that started in 2009, but it’s possible that the FED and fiscal policy could kick the can further down the road. It’s also possible (and we already are seeing indications from a global perspective) that we could see a global recession that would cause more unemployment, lower GDP, and could lead to potentially historic deficits for large parts of the developed world, which could in turn cause other issues. I think that is something that will happen. If you asked me 10 years ago, I would have expected it to already have happened, so yes, it’s possible that we extend out this cycle to the middle of next decade. The short answer is it’s too hard to tell at this moment. We need to pay close attention to how trends develop over the next 12 months and that should give us a better idea. See the next chart to look at the probability of a global recession, as you can see many times it is a lagging indicator, meaning we are already in a global recession. It’s above 95% probability at this point, and you can see going back to the 1970s that it does a pretty good job of predicting recessions (about 90% accuracy). The bottom line is we are in a very precarious position in the business cycle both here in the US and globally. Going further in debt and printing more money can only postpone the inevitable. It can’t ultimately stop the business cycle from rolling over. Ultimately in expansions you run out of workers, which puts pressure on wages and corporations’ bottom lines (which is a main indicator of the end of the cycle). Speaking of ends, we wouldn’t mind seeing the end of this snow. Until then, stay safe and have some fun. As always, we welcome your thoughts or questions.